Across the board, athletes start way too late with the whole job of getting recruited. It's absolutely understandable it doesn't have first priority with all the other areas of life requiring attention, but perhaps it helps to get a single point in time to hold on to: Junior year. Find out in a lot more detail when you should start doing what in your final four years in high school! It's all about timing and you want to be ahead, not running behind. 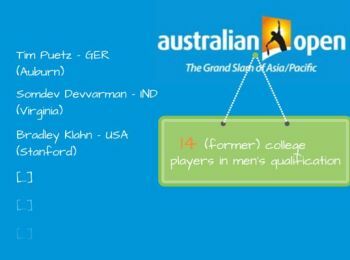 For domestic students: "When to Start The College Tennis Recruiting Process"
For international students: "When to Get Recruited as an International?" For starters, any student has every right to dream of course, but very often there is too large a gap between dream and reality. What is meant with that? "I want to play D1 tennis." "But have you considered other divisions as well?" "No, I think I can play in Division 1." That's a problem and a big mistake. Not only are you wasting time chasing something that is almost impossible to achieve, you also lose out on other attractive opportunities at schools in other divisions. Talk to your coaches and family, be honest with yourself and try to really understand your level of play! You can still dream and try to reach higher when it comes to contacting schools at a later stage, but you will profit massively from having a real understanding of how strong you are to start with. A realistic assessment of how strong you are in school is normally a lot easier for students. You got your GPA, class rank, perhaps test results as well. Now, taking into consideration all of these pieces of information you should arrive at an understanding what kind of school you could get into (from a purely academic standpoint). 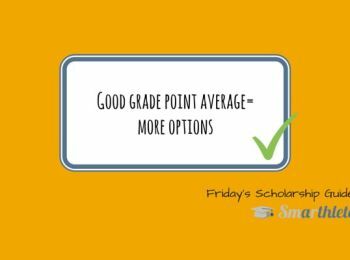 Way too often we hear of kids wanting to go to a top-ranked school, but their grades and/or test results really don't put them in the position to justify these expectations. 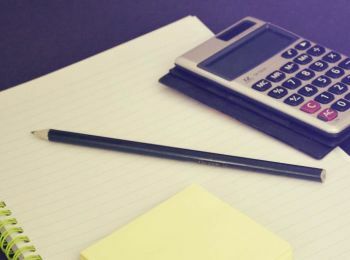 Again, you can dream and reach out to more challenging schools, but be realistic about your chances of getting in there, as you might just run into the risk of wasting time and losing out on options that fit much better. That's where all of the above blends together. For starters and this is really important. Full-rides (100% scholarships) are not common, unless you are a female tennis player at a fully-funded D1 or D2 school. 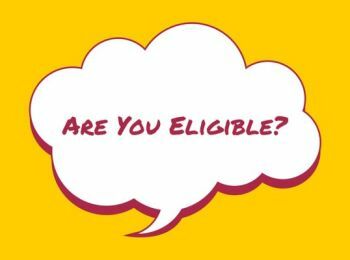 Yes, there are full-rides and yes, with a great level of play (and academic merits) in place you have a great shot of receiving a full-ride, but for the overwhelming majority of athletes, that's a dream scenario. In case your parents are willing to support you significantly - that's wonderful and you should thank them for all their sacrifices! It will open plenty of doors and allow you to speak to more schools about getting recruited. Domestic students should certainly look into receiving financial aid from other sources (such as FAFSA). Once you know the amount of money you have available, you can start estimating what teams in what divisions might be the most interesting options for you. For example, the cost of attendance at junior colleges (NJCAA) is way cheaper while offering athletic scholarships, whereas four-year schools are more expensive. The third most common mistake. Did anyone say getting recruited is not hard work? Either that's a lie or that person was just tremendously blessed. What hurts the most is watching recruits display a lack of dedication when it comes to their own future. You could also call it "laziness" or "lack of discipline", it's more or less the same. It's when you don't bring up the necessary time to take care of the above activities. Coaches sense your attitude and passion and if they had to choose between two players - one displaying dedication and the other one clearly doesn't - their impression of who you are and how you behave will help them make that decision. It's your choice whether you inform yourself and whether you are on top of things or not. It's your choice whether you research the coach's school you are about to have a recruiting call with or not. But keep in mind: ultimately, it's the coach's choice whether he/she will recruit you or not. Related to the above is the way you communicate with coaches. Do you respond to their emails and phone calls right away or do you let a few days pass before you get back to them? Do you keep coaches informed about how you're doing on and off the court? Do you write messages in a polite manner or are you borderline rude? Do you show an interest in the school that is trying to recruit you, by asking questions about the team, coaching style or classes? If the answer to all or some of that is No, you might have a problem. Or put differently, it most certainly won't help you come across in the best possible way - what a bummer! (For some inspiration on what to ask college coaches, check out our "5 Questions to Ask College Tennis Coaches Before Signing"
Finally, the last big mistake people keep making is a scenario, where they have one or more offers, but they don't accept the offer. Instead, they keep shopping around, hoping to find an even better offer at a school. That is understandable and there is nothing wrong about it, but you can take it just slightly too far to the extent that the coach understands he/she is not your first priority and decides to go for another recruit (possibly even weaker), but one who is completely committed to the program. In order to not make that mistake, it requires you have a rocksolid understanding of your level of play (sports), how strong you are academically and what you can expect from the recruiting process. Add to that, your expectations from your future college (remember what we talked about above: "researching schools") and finally the ability to recognize when the offer on the table is a good offer for you! How do you avoid making these 5 Biggest Mistakes? How do you make sure you navigate through the recruiting process smoothly? A good starting point is informing yourself extensively. 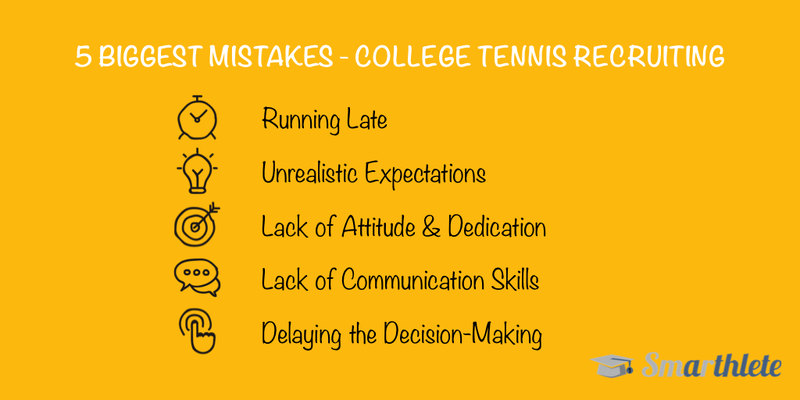 Read up on college tennis, the way it works and take ownership of your future. Here on Smarthlete you can sign up with a free recruiting profile, get informed on the process, and receive timely reminders on when to do what. On top of that and as a premium user, you can research teams based on different criteria (athletically, academically, financially) and see your Personal Fit with universities: a rating of how well you match with certain universities! A small investment with a huge savings potential! In case you have any questions contact us at contact@smarthlete.com!